Schwarzenegger's 1993 meta-action adventure is why Rob loves the movies. There's an old cliche about our personalities being the sum total of everyone we've ever met. Those close to me would tell you that I'm the sum total of every movie I've ever seen. There are a few especially formative ones: Jaws, The Princess Bride, High Fidelity, movies that I've memorized after countless viewings and incorporated into my day-to-day life. I've always preferred these concentrated morality tales to the broad and convoluted struggles of reality because they represent life as I often wish it was. Immersing myself in the worlds of The Godfather or Fargo provides a kind of order and logic, lessons on what can and should be done in challenging times. It's a sense of security, the feeling of home. That's not to say this adherence to a certain expectation can't be a bit alienating; people like me are often described as "socially handicapped" or "maladjusted." 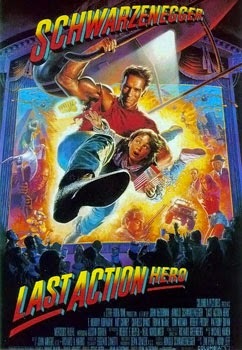 Thankfully, Hollywood had the presence of mind to realize that weirdos like us have money too, and in 1993 they green-lit the story of a lonely kid with a magic ticket who gets to live out his action movie dreams: Last Action Hero. It's one of my favorite films and likely the sole reason The Ugly Club exists at all. Danny Madigan (Austin O'Brien) likes to skip school in favor of afternoon movie screenings. 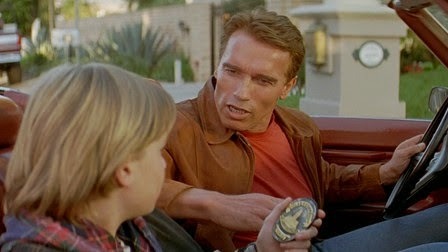 His favorites are the adventures of Jack Slater (Arnold Schwarzenegger), a full-throttle action hero who blows through cars full of henchmen while chewing on cigars and spewing cheesy one-liners. Danny's home life definitely leaves a hero to be desired: He and his mother (Mercedes Ruehl) are stuck in a tiny New York apartment. Home invasions aren't uncommon. It's a sadly familiar story that fuels Danny's love of escapist entertainment. One day, kindly grandpa and cinema owner Nick (Robert Prosky) passes on an old family heirloom - a "magic" ticket that allegedly came straight from Houdini himself. Wouldn't you know it? The magic is real, and Danny finds himself thrust headfirst into the new Jack Slater adventure. Here's where things get meta: While dodging terrorist's bullets and the wrath of the Angry Police Captain Who's Had Just About Enough, Danny tries to convince Jack that he's actually a fictional character. Hasn't he ever thought about why he never runs out of ammunition? Why he's able to gracefully land thirty-foot falls and dispatch villains with the pointy ends of ice cream cones? Why every single woman in Los Angeles is a stacked blonde in a vinyl bodysuit? Isn't it obvious that this is a movie? From there it's your standard shoot-em-up chase and explosion adventure. All the tropes are accounted for: The brilliant Charles Dance as glass-eyed henchman Benedict, Slater's feisty and beautiful daughter Whitney (Bridgette Wilson), and the old partner who's clearly going to turn on Jack in the last act (F. Murray Abraham). For Danny, it's all obvious formula (he recognizes Abraham from his role in Amadeus and correctly predicts his double-cross). For Jack, however, it's life. This might not be saying much, but Schwarzenegger is at his best here as the oblivious blunt instrument. His moments of self-awareness feel a bit forced, but it's in service of something interesting and the plot quickly becomes as incomprehensible as any film he's made before or after. Why are they attending the funeral of Leo Le Fart? Why does Slater leave Whitney and Danny alone when there's a mad man hunting them? Because it's been fifteen minutes without an action scene, that's why. It's brilliant stuff that pays off in spades. But we don't rest on these laurels for long: Benedict takes the ticket and makes his way into the real New York. It's a strange place where the police are over-worked, the citizens are ugly and apathetic, and it always seems to be raining. A place where the bad guys can win. A place where Jack Slater is actually Schwarzenegger, an egotistical movie star who loves the spotlight. This is the film's most brilliant meta beat because instead of laughing at the fantasy of the movie world, we're forced to come to terms with the sad and cynical nature of our own. Benedict encounters teenaged prostitutes, freezing homeless men, and a pair of muggers fixated on reliving their mark of his shoes. His reaction is almost tragic; even an action movie super-villain couldn't imagine a world this bad. It's a theme I wish the film spent more time on. Instead, he sees an opportunity to eliminate his nemesis forever and sets a plan in motion to dispatch Schwarzenegger at the Slater IV movie premier. Unfortunately, this is where things falls apart. The film loses interest in Benedict and brings in the Ripper, the villain from Slater III, and Jack avenges the murder of his son. It's a false beat that stinks of multiple script drafts (Shane Black and William Goldman both took turns rewriting the original screenplay). If the emotional arc of Slater's character is supposed to be coming to terms with being a fictional character in the real world, shouldn't he be focused on finding ways to understand his newfound mortality? Short of that, a better climax might have involved Slater drawing Benedict back into the movie world and really taking advantage of the ridiculous feats he's only capable of there. The villain isn't given a real arc, either: Benedict gloats about being able to bring Dracula and Hannibal Lecter out of their celluloid prisons but isn't given the opportunity to do so. He's quickly dispatched without ceremony and we're handed a smaltzy message about the magic of movies (a theme better explored in The Purple Rose of Cairo). It's such a painfully missed opportunity to focus on something more interesting. The film isn't given the chance to pay off any of the themes it sets up during its fantastic opening hour. I wonder if they worried we just weren't ready for that yet. It was 1993, after all. Speaking of which: The financial and critical failure of Last Action Hero has become the stuff of Hollywood legend and the subject of chapter after chapter of tomes on screenwriting and filmmaking. It suffered through rewrites and a rushed production, through focus groups and poor advertising, only to die a slow and painful death at the hands of Jurassic Park, which opened a week before. Still, there has never been a better time to revisit it. Ignore the Rotten Tomatoes score and give it a shot. Ironic and self-referential romps like Scream and The Cabin in the Woods owe so much to the film, and it's nice to remember a time before the internet when being snarky and meta was truly revolutionary. Hell, I had fun just seeing the interior of a Blockbuster Video again. It also reminds us why we use these cliches: Because they work. They're magic. They inspire confidence and joy. We like knowing where the story is going and watching it meet and exceed our wildest expectations. It's that sense of security I discussed before. 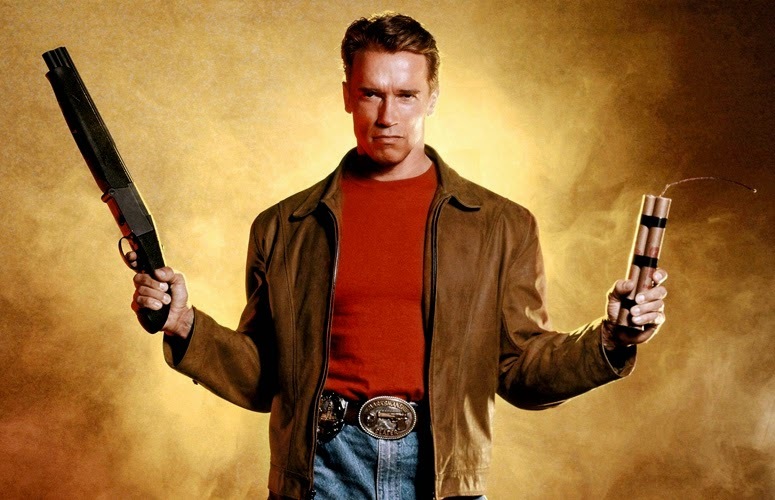 At its core, Last Action Hero is a lovably ambitious mess. It's the product of too many cooks in separate kitchens or not enough cooks in one. But most of all, it made me fall in love with loving movies. It taught me all the shortcuts, habits, and techniques that I always sensed but never knew the names for. It validated me. Isn't that what it's all about?